Chris Dyer is an emeritus Professor of History of the University of Leicester. His research interests include rural settlements and landscapes of the medieval period in England, including dispersed settlements, and he has speculated about the origins of villages and hamlets. His interest in later medieval settlements and their shrinkage and desertion connects with his historical work on the economic and social history of the medieval countryside. He has explored the history of towns and their contacts with their rural hinterlands. He is currently carrying out fieldwork and documentary research on a number of villages in the west midlands. Recent work in Worcestershire has focussed on the expansion of settlements in the 1330s. A Gloucestershire village, Pinbury in Duntisbourne Rous, has been revealed to have been a loosely nucleated settlement that began to decline at the end of the 13th century. Research into some south Warwickshire villages (such as Compton Scorpion, Weston juxta Cherington and Long Compton) involve comparing deserted and surviving settlements. 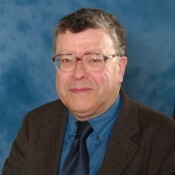 His publications include Standards of Living in the Later Middle Ages (1989; revised 1998), Making a Living in Medieval England (2002) and A Country Merchant (2012). He has published a good number of articles, essays and chapters in collected volumes.